In skiing, if you do not have the right boots, you won’t be able to perform your best! Talking about the right ski boot, Apex is a well know brand in the category. 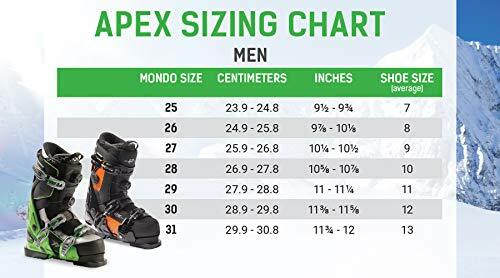 In this post, we will be covering the detailed version of the Apex Ski boots review along with suggesting you the best models of the same brand. Typically no other outdoor sport demands so much perfection as skiing. The comfort level of your boots will decide how good you will perform in the sport. Apex ensures that they can cater to skiers of all segments- beginner, intermediate and pro. More than this, they have a collection of ski boots for wide feet and normal feet separate so that skiers can decide better on their choice. Now let’s get to the ground level and take our review to the next level by knowing in-depth details about the brand and its recommended boot models. In this detailed Apex ski boots review, we started our research from the ground level to know the details of the brand. We reviewed more than 53 customers who were using the brand and took their collective views to jot down our list of features. In order to become a legacy brand, Apex aims at providing the most comfortable and performance driven ski boots. They do a rigorous research on their technology and try to bring the best of the version for the skiers. Apex is one of those very few brands that is doing and utilizing nanofibers in their ski boots. Their two-part open chassis system is really innovative which offers a walkable boot design so that you can use the boots for both skiing and walking. Seeing the pain point of skiers, getting in and out of the boots is the most cumbersome task. Ski boots take a good amount of time in wearing them and vice versa. The Apex ski boots focus on easy visibility so that getting in and out of the boots becomes easy like wearing normal hunting boots. Most of the Apex ski boots have got an 18 point closure which helps in perfectly fitting the boots in your leg. Apex offers a warm inner lining so that your feet stay warm and prevents them from becoming numb due to snow and less temperature. Though, you can also use heated socks for the same purpose. Apex ski boots are one of the most durable ski boots in the market. They are good for beginners to pro level skiers alike. The brand offers different segments of ski boots depending on the performance you want and the price you can bear. Though, they offer the most affordable ski boots to advanced level expensive options too. Now that you have read a detailed version of the features offered by the brand, it is time to cover the most anticipated and best Apex ski boots that are quite known and heavily used by the skiers. 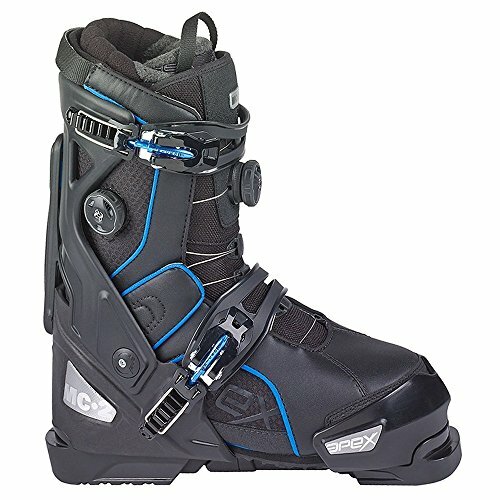 As mentioned in the title itself, Apex MC-2 is a high-performance ski boot. It is a perfect Alpine ski boot and mostly favors intermediate to pro level skiers. The MC-2 has got a very durable and rigid outer chassis. Like most of the boots by Apex, the MC-2 has got 18 points closure system. The dual boa closure system favors you to get inside and out of the boot quite fast. 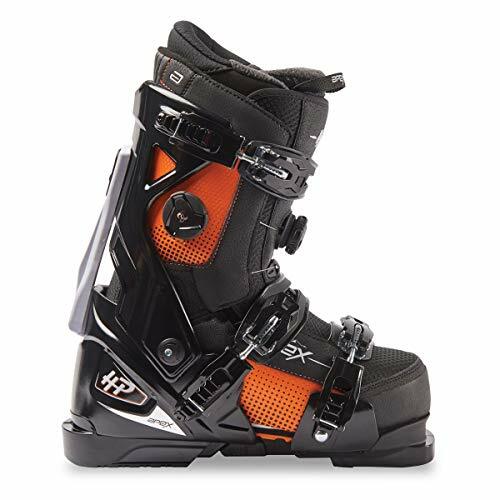 The Apex HP 30 is one of the most comfortable ski boot by Apex. It is a walkable boot. You just need to detach it from the frame and you are good to walk in the streets. The warm inner lining of the boots helps your feet to stay comfortable and warm throughout your skiing session. The design promotes a very customizable fit. The Apex HP-30 fits any kind of feet using its infinitely adjustable fit. The boots include a serpentine lacing system that helps in accurately fitting the boot in your leg. It has a 3 point instep strap helping you to fit the boot according to the rigidity you want. The Apex XP uses the Vibram IceTrek hi-traction outsole, another next-gen tech from the house of Apex. This helps in making the boot very durable and sturdy. Now, you can easily forward lean using the adjustable flex arm, a much-needed feature. It isn’t the most comfortable boot option, though, it fits the best for normal feets. Apex offers the most comfortable ski boots. Next gen improving technology for better design frame and performance. Inner warm lining for added comfort. Dual nature supports both skiing and walking. 18 point closure ensures a comfortable fit. Most affordable to expensive ski boots. Ranges ski boots for beginners, intermediate and pro level skiers. Durable and sustainable design promotes longevity. Check the model before buying for different boot size. For eg: Apex XP isn’t preferred if you have wide feet. Some models like Apex XP take time in adapting to your feet design. Beginners might feel that the boots are overpriced. Apex is a trusted ski boots brand which offers really great options in different budget segments. You can trust the rand as it offers a range of high performing, rigid, durable, highly adjustable, sturdy, affordable ski boots range which suits the pockets of all levels of professional skiers. We hope that you must have enjoyed reading this detailed version of the Apex ski boots review as we covered its features and pros & cons in detail. do tell us your views in the comments section below. Tell us if you want us to over any other boots brand on our website. We would be happy to help you.